A nutritious diet consists of eating healthy protein, carbs and fats. All foods give us doses of these macronutrients in different amounts. Whichever macronutrient is the most prevalent ends up with that macronutrient as it’s tagline name. Meats, for instance are known as a protein, but they also provide some fat. Plant foods are mostly known as carbohydrates, but they also contain protein as well. A common thought is that protein is only available from red meat, poultry or fish, eggs and dairy. While all of these are excellent sources of protein and provide the body with nutrients, an often-overlooked way of getting our protein every day is to eat more beans and legumes. Beans are a part of the large food group called ‘legumes’ and can not only provide us with the body building protein we need to stay strong and healthy, beans provide us with a number of health benefits that no amount of animal protein can provide. The American Heart Association advises us that eating less red meat and processed meats like cold cuts, sausage, bacon and other cured meats decreases the risk of so many of our modern-day lifestyle diseases- heart disease, stroke, diabetes, obesity, high blood pressure, high cholesterol, and many types of cancers. That’s a pretty good reason to start incorporating more beans and legumes into our daily diet. What is the difference between beans and legumes? It’s a bit confusing sometimes when we hear “eat more beans and legumes”. What exactly is the difference between beans and legumes? Simply put, all beans are legumes but not all legumes are beans. 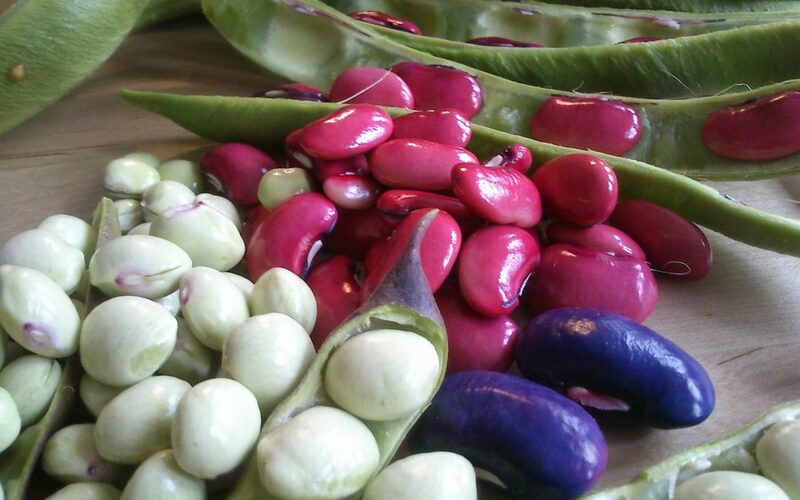 Beans are the seeds of plants; legumes refer to all of the plants whose fruit grows in pods. The big categories of “legumes” is actually broken down into subsections which include beans, lentils, peas and peanuts. (Did you know that peanuts are a legume and not really a nut?) We know most of the bean names- black beans, red beans, kidney beans etc. however many plants that people think of as vegetables are actually legumes- peas, green beans and sugar snap peas are examples of legumes. Benefits of Beans and Legumes: Eating more beans and legumes benefits the body in many ways. 1. Cheap but nutrient packed protein source: Beans and Legumes can provide protein that is cheaper and full of more nutrients than animal meat. Why do we need protein? Your body needs protein every day and it needs a continual source of it which means you should try and include a protein in all of your meals and snacks. The body uses protein to both repair and to build tissue, bones, muscles, skin, blood and cartilage- the entire infrastructure of your body needs protein. Protein is also used to make things like enzymes, hormones and other chemical components that make the body and the mind run smoothly. A bit of chemistry here. If you look at the chemical structure of a protein it is made of up of something called amino acids. There are 20 different amino acids that are needed to make up a protein but your body cannot make 9 of these. These 9 amino acids are called “essential amino acids” because you need to EAT them in order for your body to be able to do all of that building and repairing that was just mentioned. When we eat animal sources- meat, poultry, fish and eggs and dairy products they provide all of these 9 essential amino acids. Soy and quinoa are two plant sources that provide all 9 essential amino acids. Beans (except for soybeans) are comprised of amino acids but not the complete set of 9 essential amino acids. They are referred to as incomplete proteins. But the good news is that you can eat other plant foods that ‘compliment’ and complete the amino acid structure in a bean. For example, if you eat nuts, seeds, or some whole grains along with your beans (or even at any point during the same day) they will all join up as one big happy complete protein inside your body and provide the same muscle, tissue, blood, and structural building crew inside you that animal protein provides. 2. Beans are Full of Fiber: Getting in 25 – 35 grams of Fiber every day is important. Fiber helps with weight loss because it helps you feel full longer and helps you to completely process and digest the food you eat. It’s also important for heart health because it helps to reduce cholesterol levels and improve blood pressure levels. Fiber improves blood sugar levels in people with diabetes. It is important to your digestive health in a few ways. It not only helps with constipation, it is also important for the overall health of your gut which is directly tied to your mood, your memory and your ability to concentrate. Fiber also quells inflammation in the body. The best sources of soluble fiber are oats, beans and fruits and vegetables and beans take the lead when it comes to fiber. Just one cup of black beans provides 15 grams of fiber! That’s half your daily requirement. 3. Beans Improve Heart Health: The American Heart Association found that eating beans (and nuts as well) lowers the risk of heart disease, stroke and diabetes. Beans are packed with nutrients like thiamine, riboflavin, niacin and folacin as well as potassium, calcium and magnesium. Folate lowers your homocysteine levels. Homocysteine is an amino acid that is found in high concentrations in meat and high levels are linked to heart disease. Potassium helps to regulate blood pressure. Beans lower blood cholesterol levels as well due to both their fiber and nutrient levels. 4. Beans help Regulate Blood Sugar Levels: Beans have a low glycemic index rating- meaning they won’t spike your blood sugar. Part of the reason for this is the high fiber content in beans. Fiber slows down your digestion (which is why you fell full longer) which means that any part of the bean that is broken down into glucose is released more slowly into the bloodstream than if, for example, you ate a cookie or drank soda which typically just flood your bloodstream with sugar immediately after you consume them. This makes beans a must have if you are diabetic or pre-diabetic. Studies have found that soybeans even support the healthy functioning of your pancreas. The pancreas is the organ that releases insulin to regulate the sugar in your blood. Keeping the pancreas healthy is important to preventing diabetes. 5. Beans Reduce the Risk of Cancer: Beans are loaded with antioxidants. Antioxidants help fight the free radicals in your body (See Antioxidants 101 Rolling Strong Wellness Blog) and reduce the risk of cancer in the bodies. Just eating ½ cup of red beans provides you with 13,727 antioxidants; red kidney beans provide 13,259; pinto beans provide 11,864; and black beans provide 4,191. Beans top the charts when it comes to antioxidants. 6. Other Benefits: Beans are also shown to help reduce iron deficiencies, which is one of the most common causes of anemia. They benefit enzymes in the body which support your connective tissues and joints as well as eye health. Beans are convenient to buy in cans, just make sure you rinse well to lower the sodium levels in the canned food. You can prepare them yourself from dried beans- but you don’t want to eat them raw and uncooked. Always wash dried beans thoroughly and follow cooking instructions. They keep well in the fridge after cooking and you can use them all week in a variety of different ways. Just a word of caution: If you suffer from IBS or other intestinal issues, discuss bean intake with your doctor. Snacks: Slow roast some chickpeas for a tasty snack. Just toss in a bit of olive oil and roast on low heat in the oven. Bag them up and go for a delicious snack on the go. Beans are low in fat and calories but packed with protein, fiber and nutrients. They help you lose weight, prevent diabetes, stroke, heart disease and even cancers. They improve your mood, your memory and your concentration levels as well as keeping your digestive system healthy and functioning. They are simple to prepare, very filling, and offer a wonderful way to incorporate more plant foods into your daily food intake.